Come join the fun in downtown at the State Library of Louisiana, the State Capitol, the Capitol Park Museum and nearby locations. It'll be offering unique opportunities for book lovers of all ages to interact with exceptional poets, writers, and storytellers and enjoy an inspiring variety of literary activities, demonstrations and exhibitions. 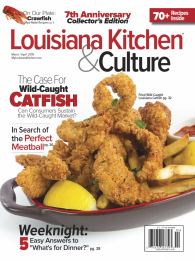 You will enjoy puzzling over a good mystery, have a thirst for history, can't get enough of poetry or love to cook up some yummy Louisiana dishes.